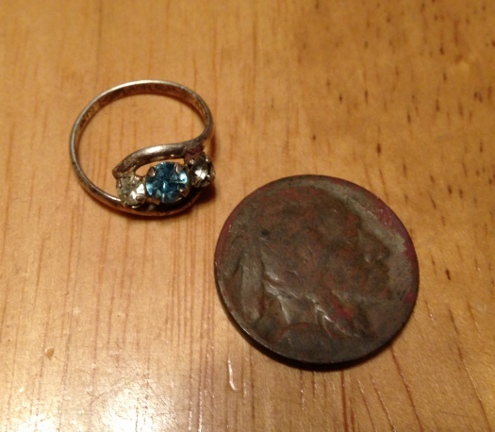 March was a bad month for me as far as metal detecting goes. I hardly got out to hunt at all. On this last day of March I managed to get out to the park for a couple of hours of quality time with Maurice. After digging a number of small pieces of old brass I got a signal that was reading like a wheat or an Indian Head but instead was a dateless Buffalo nickel. Actually there is a date but it is hardly visible. It looks like a 1929 but I could be wrong. 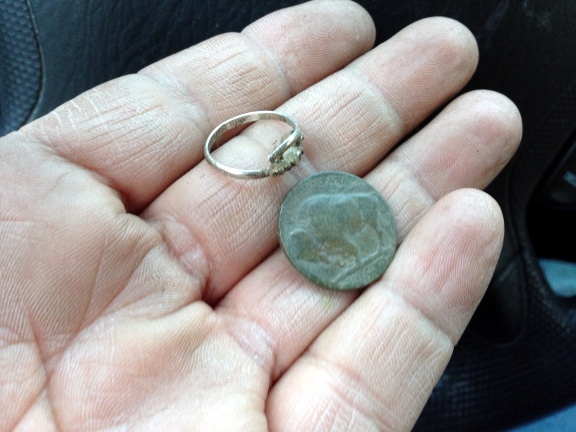 On my way back to the car, I got another signal I thought would be a wheat or an Indian but it turned out to be a small silver ring. So I ended the month with a cool coin and some silver. Here’s hoping that I can hunt more in April! What does the inside of the ring say? It looks very cool! It says ‘Sterling ESPO’. I don’t know what the ESPO stands for but the ring looks to be sterling silver. The stones are glass as the main blue one is chipped. You know another Wichita area hunter found an ESPO ring last week.. We concluded it was a makers mark. Can’t remember his exact name though. Congrats bud! Pretty ring that you found!